Spoiler alert: More are coming. In the world of Attack on Titan, humanity has been overrun by giant, slack-jawed humanoid creatures of varied shapes and sizes, and they only want to do one thing: devour every person they can get their hands on. What quickly unfolds as more Titan Shifters become known is a conspiracy about the nature of the world, the origins of the Titans, and the spiritual and political structures keeping everything — even the Walls themselves — intact. Very quickly, Eren and viewers learn that he’s not the only Titan Shifter around — and very few of them are on the side of humanity. In human form, a Titan Shifter seemingly gets increased strength and advanced capacity to heal themselves, but the real power comes from their transformation into a Titan by focusing on an act of self-mutilation. Beyond that, their forms vary wildly in size and powers. Here are all of the confirmed Titan Shifters revealed in the anime thus far. This article is updated as new information about Attack on Titan’s story is uncovered in the anime series. 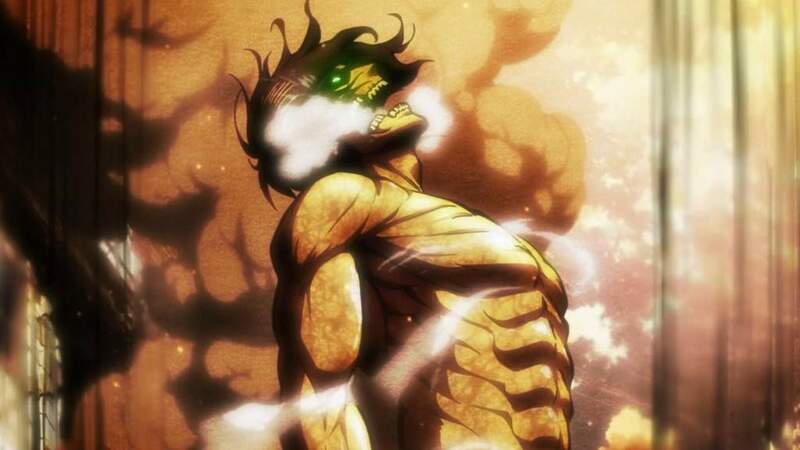 Eren in his Titan form has a muscular physique, an overly long jaw, and glowing green eyes. In a very brief flashback early on in Season 1, we see Eren wrestling with his father before getting some kind of injection into his arm. We’re led to believe that this is what eventually gives Eren his powers, but the anime hasn’t been able to close that narrative loop. His family’s old basement and the answers it holds are a distant goal. After getting maimed and eaten by a Santa-looking Titan in the Battle of Trost District, Eren’s fury triggers his first Titan transformation. Though he has trouble controlling it on subsequent transformations — even struggling just to transform due to performance anxiety at times — he is successfully able to plug the hole in Wall Rose with a giant boulder and is able to defeat the Female Titan at the very end of Season 1. Eren’s hatred of Titans and ensuing rage seem to power his Titan form, leading to surging bright cracks of energy in his skin at times. His Titan form seems to have heightened strength, durability, endurance, and healing compared to others. It makes Eren’s Titan form a thing of chaos, but one that gets the job done when it counts. Annie Leonhart is the Female Titan. Suspicions about Annie Leonhart’s attitude and motives start fairly early in Season 1 of Attack on Titan, but it isn’t until after the Female Titan’s appearance that the show begins to make visual links between the seemingly overpowered Titan and her similar-looking human counterpart. The Female Titan appears out of nowhere during the Scout Regiment’s 57th expedition beyond the Wall, quickly making short work of many soldiers in the process. She displays intelligence and the ability to target specific areas of her body to cover in diamond-like armor or to focus on healing even faster than normal. In addition, her shriek can lure numerous Titans to her location, inducing in them some kind of frenzy. In the Forest of Giant Trees, the Female Titan abandons her trapped body as it is devoured by Titans, traveling through the forest in human form with the aid of 3D-maneuvering equipment to kill several Scouts and eventually escape. At the very end of Season 1, Armin deduces that Annie is the Female Titan and sets a trap that forces her to expose herself. This eventually leads to a fight in which Eren is able to defeat her, leading to Annie’s capture after she encases her human body in diamond armor. Because of that, it’s nigh impossible for the military to interrogate her or deduce her motives. Though her transformed state bears no official designation, Ymir outed herself as a Titan Shifter at the very end of Season 2’s “Soldier”, when it was either let her friends die or defend them in her Titan form. Mysteriously enough, minutes before transforming, Ymir could read the text on an ancient can of fish — but the show hasn’t explained why just yet. She also devoured Reiner and Bertholdt’s friend Marcel at some point in the past, as the two of them remember. In her Titan form, Ymir is comparatively small at 5 meters in height, making her the smallest Shifter by far. To compensate, she is highly mobile and maintains a great deal of control over her body. As such, she’s able to leap around and target enemy Titans in their weak spots. She is also able to stammer out a few spoken words in times of need, as she displayed in “Historia”. Though she doesn’t appear to be allied with the Armored or Colossal Titans, it’s unclear what her true motives are beyond clinging to Christa/Historia. The first appearance of the Armored Titan. The Armored Titan hadn’t been seen for five long years before Reiner transformed in Season 2’s “Warrior.” At the start of the series, Reiner burst through a section of Wall Maria in his Armored Titan form, leading to the death of countless citizens, including Eren’s mother. He then spent five years infiltrating the military with the 104th Training Corps collaborating secretly with Bertholdt and Annie while gaining everyone else’s trust as a “big brother” sort of figure. Reiner tells Eren that he and Bertholdt are Titan Shifters in the middle of Season 2, threatening to attack the Wall and soldiers nearby if Eren doesn’t agree to return peacefully with them to their village. This, of course, leads to a massive confrontation. Though Reiner’s exact motives remain unclear, the Female, Armored, and Colossal Titans (which are working together) continue trying to capture fellow Titan Shifters whenever they can for some unforeseen reason. Much of the Armored Titan’s body is covered in hardened plates, making it much heavier and more durable than any other Titan of comparable size. The increased weight results in less stamina, but the Armored Titan still remains agile and capable of building up a great deal of momentum — which is how it was able to burst through the interior gate of Shiganshina district. It’s armor plating also offers it a great deal of defense against typical human attacks, including ultrahard steel blades. Eren confronts the Colossal Titan. Another self-declared “enemy of humanity,” the Colossal Titan was responsible for the conflict that began the series and orphaned Eren and Mikasa. Later, in the Struggle for Trost arc, Eren comes face-to-face with the Colossal Titan but isn’t able to directly engage it due to all the steam coming off its body. Later, Bertholdt is outed as the Colossal Titan when Reiner breaks down in a moment of exhaustion and threatens Eren halfway through Season 2. Despite being so much larger and presumably more powerful than the Armored Titan, Bertholdt defaults to following Reiner’s lead. The two worked in conjunction with Annie’s Female Titan for years on some unspecified mission against humanity, but part of said mission seems to be kidnapping other Titan Shifters like Eren and Ymir. The entirely skinless Colossal Titan stands four times taller than the next-tallest Titans. By comparison, Eren and Reiner’s Titan forms are only 15 meters to the Colossal Titan’s 60 meters. As such, it can bust open gates on the Walls with a single kick. It’s also able to control the amounts of steam its body emits, which can be used to deter potential attackers and also allow it to vanish instantly. Attack on Titan Season 2 airs Saturdays via a simulcast on Funimation and Crunchyroll at 10:30 a.m. Eastern, and it drops on Hulu at 11:00 a.m. Eastern. This article was originally published on May 4, 2017. It was last updated May 8, 2017 (12:09 p.m. Eastern).